Basically in all of my PCM1794A measurements I have seen something strange going on in the distortion figures between left and right channels. Right channel is constantly weaker but the results are very consistent between measurements, parts, and even different opamp models, while left channel shows better performance but the results are very inconsistent. I will show few examples from different measurements. To be honest, I still do not know what is the root cause of these variations. While I was expecting my design and PCB to be the guilty one, I have seen the behaviour between different component and even different PCBs, it is inevitable that I start pointing my finger at the PCM1794A itself. But before drawing the final conclusion, I will still create a very simple and symmetric test board. However, now I will just present the results I have gathered so far. These measurements are done on H-DAC boards. Pay attention to the distortion levels, meaning the part of THD+N vs. amplitude plot where amplitude is larger than -20 dBFS. There are not really noise inconsistencies between the channels. Channel difference is clear in every distortion test on H-DAC. Below is an example of THD+N vs. amplitude across sample rate. Distortion level vs. amplitude across sample rate. 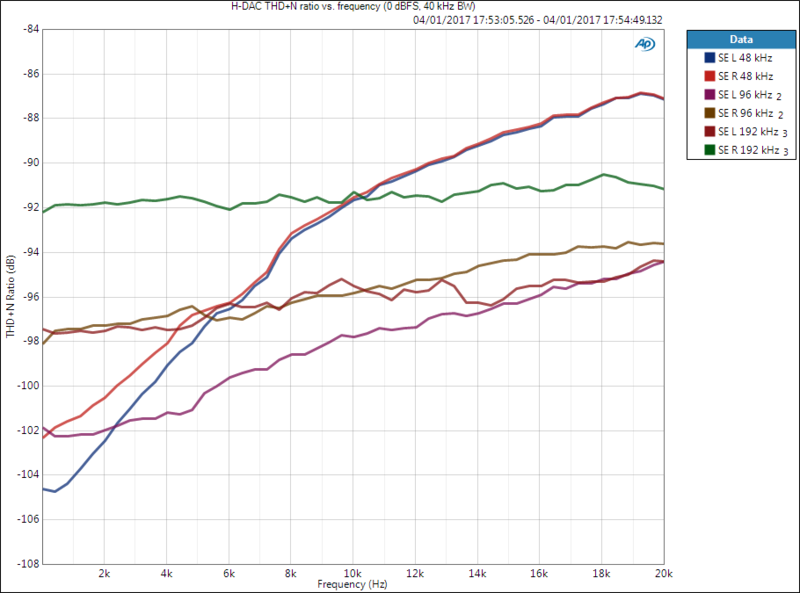 THD+N ratio vs. frequency across sample rate. 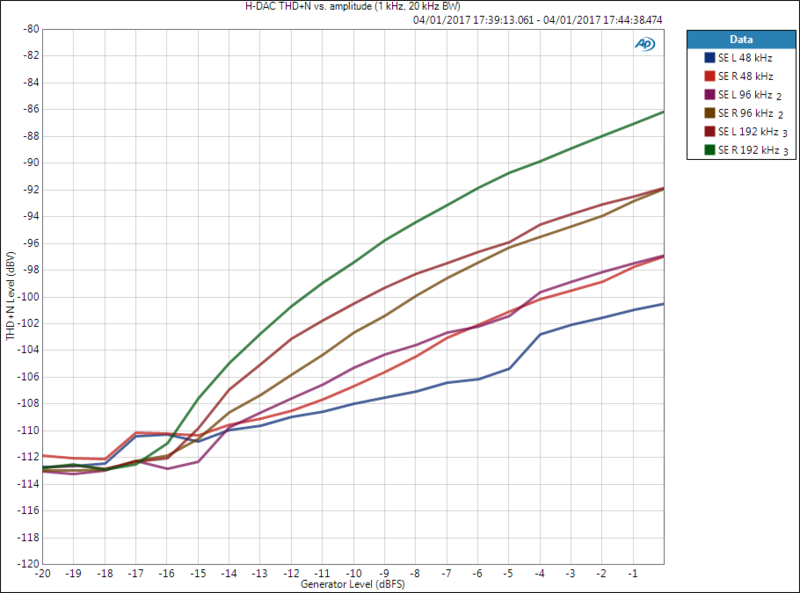 Below are tests with different I/V-stage shunt resistors I dealt with in another post. THD+N level vs. amplitude, I/V-stage shunt resistor test, right channel only. 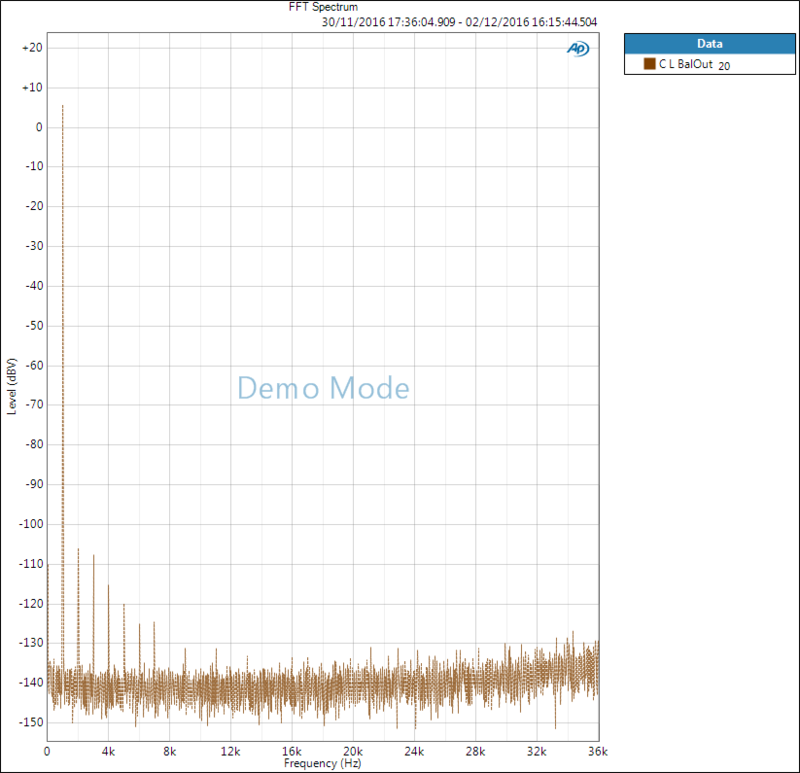 THD+N level vs. amplitude, I/V-stage shunt resistor test, left channel only. 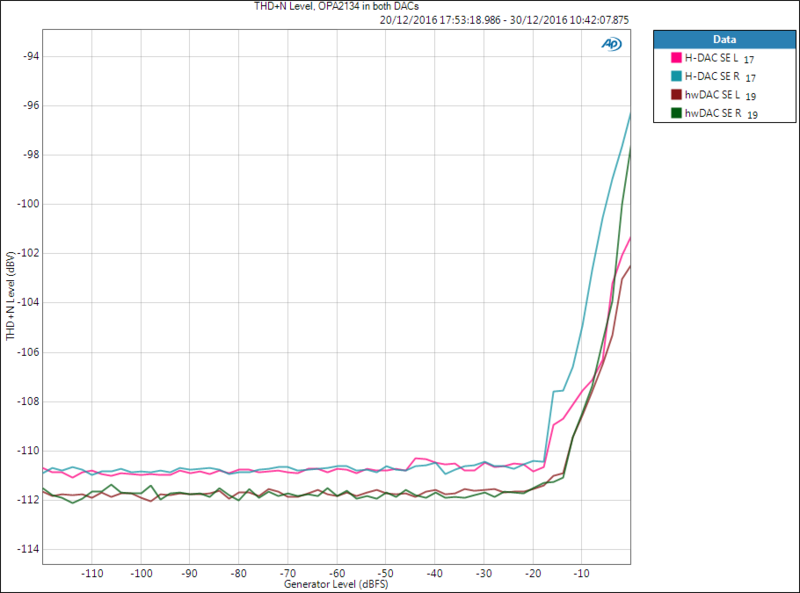 Below are plots from opamp comparison. 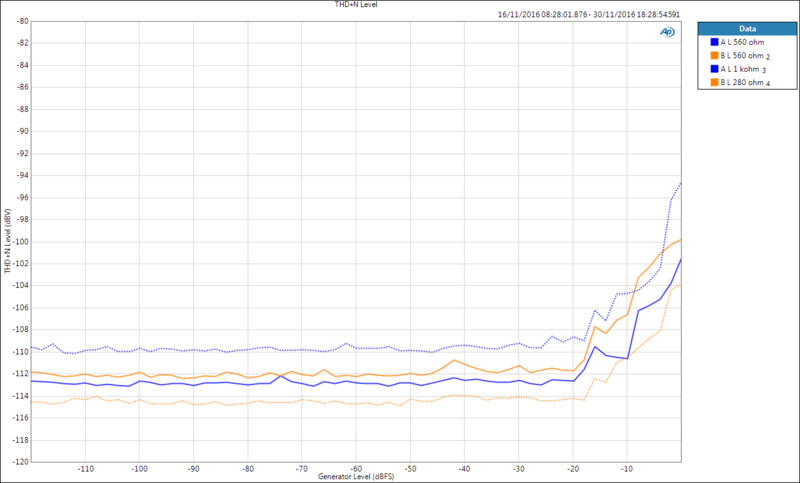 THD+N level vs. amplitude, LM4562 single-ended vs. balanced configuration. 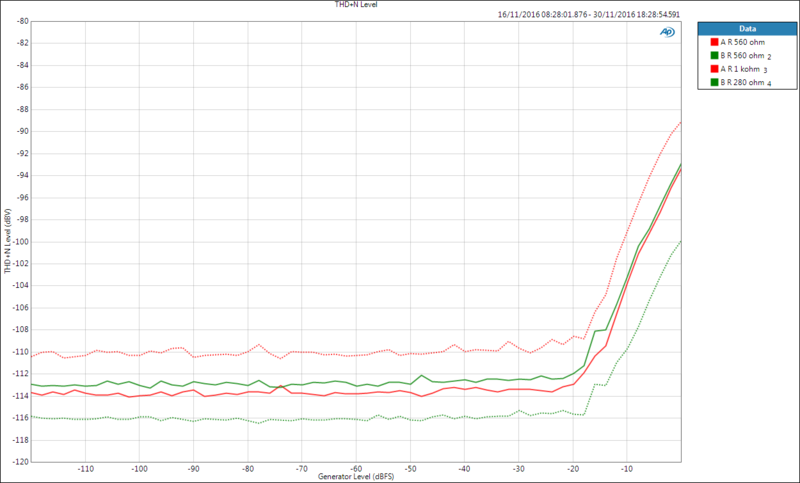 THD+N level vs. amplitude, OPA2134 single-ended vs. balanced configuration. At this point I could blame my board as it is the only common factor in these measurements. What makes things really interesting is that my few years old PCM1794A design (hwDAC) that uses OPA2134 opamps but different filter circuit and very different (2-layer) layout shows very similar phenomenon. In the older design the right channel distortion trace follows the left one first but then ends up being 5 dB worse at 0 dBFS level. 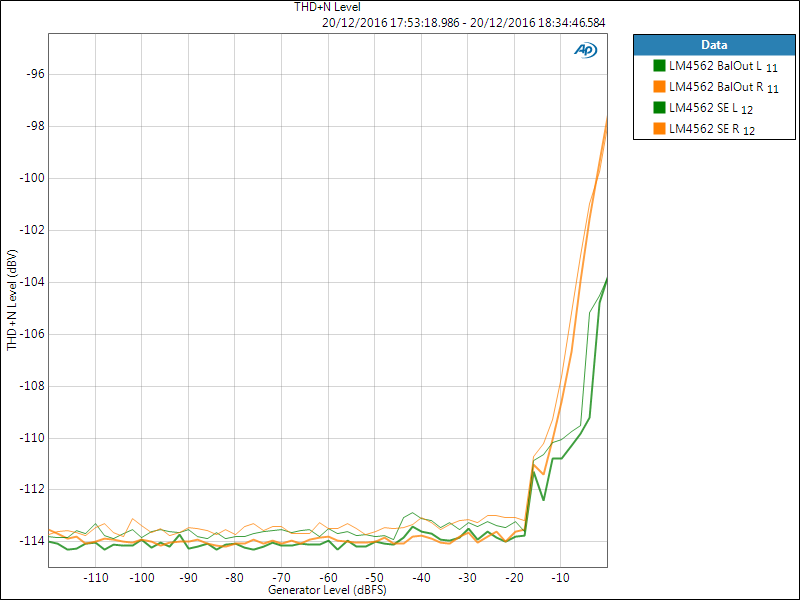 THD+N vs. amplitude, two completely different boards/designs. 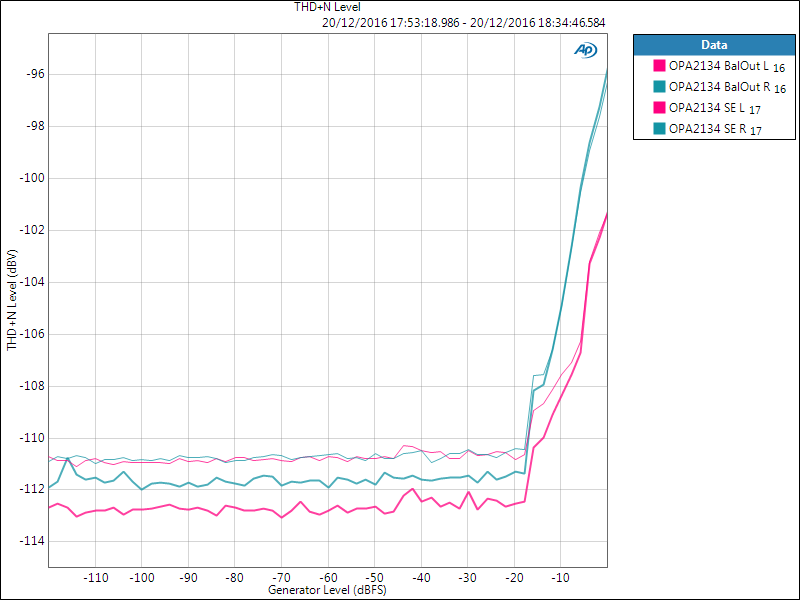 To get an idea what actually is different between the channels, below are some FFTs of H-DAC output. There are differences especially in second and third harmonics. Right channel has significantly higher second harmonic that dominates the THD+N reading. Although it really seems that there is something odd going on in the PCM1794A DAC regarding the channel differences, I will make another test board with symmetrical layout between channel and re-measure this. Before that I would be very keen to hear your measurements results if you have been measuring PCM1794A DAC with high performance measurement instruments. One important point though is that distortion in both channels of H-DAC are within the PCM1794A specifications. Therefore, it may be that this is an undocumented feature of PCM1794A. After all, the distortion levels are very low. Stay tuned for more measurements. Interesting. I will go back to PCM1794A measurements and experiments at some point later. Thank you for these measurements, Nihtila! I swapped in my ASUS Essence One MKii (2 x PCM1795) the 4 x MUSES01 with 4 x NE5532P today and 2nd harmonic lowered from -86 dB down to -102 dB and the 3rd one from 97 dB to -100 dB.